Walter F., PhD. Boron ( ২০০৩ ) Medical Physiology: A Cellular And Molecular Approaoch, Elsevier/Saunders, pp. 1,300 ISBN: 1-4160-2328-3. উৎস All used images are in public domain. 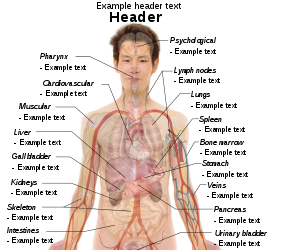 The raster (.png format) images below have most commonly used organs already included, and text and lines can be added in almost any graphics editor. 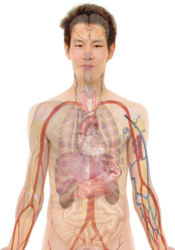 This is the easiest method, but does not leave any room for customizing what organs are shown. 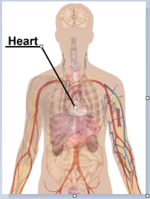 By this method, body diagrams can be derived by pasting organs into one of the "plain" body images shown below. 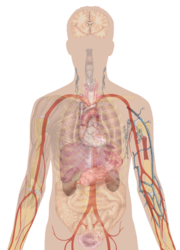 This method requires a graphics editor that can handle transparent images, in order to avoid white squares around the organs when pasting onto the body image. Pictures of organs are found on the project's main page. These were originally adapted to fit the male shadow/silhouette. The Vector templates below can be used to derive images with, for example, Inkscape. This is the method with the greatest potential. 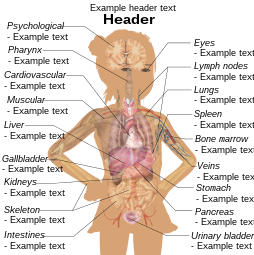 See Human body diagrams/Inkscape tutorial for a basic description in how to do this. 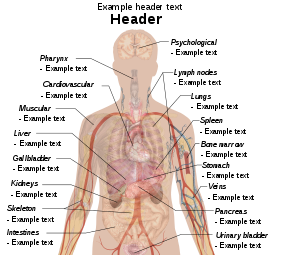 Health effects of some common types of pollution. All the images on this page are released into the public domain by their creators. This applies worldwide. In case this is not legally possible, the creators grant anyone the right to use these works for any purpose, without any conditions, unless such conditions are required by law.